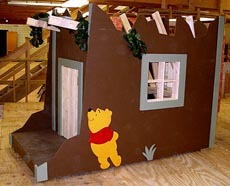 A playhouse styled on Winnie the Pooh has won the 6th annual Design & Build contest. The competition featured thirteen teams who were required to design their playhouse in a 2-week period and build it in just 11-short hours. The winning playhouse was designed by a carpenter apprentice Richard Clark. Richard collaborated with a local architect Jonathan Egger and contractor Jen Wisbon. The winning designs are set to be auctioned later in the summer and proceeds will go towards Rebuilding Together Pittsburgh at Heinz Field. The event was held on May 11th at the Carpenters Training Center in Neville Island and the award was sponsored by the Greater Pennsylvania Regional Council of Carpenters.